I taught the students about Wayne Thiebaud and we looked at all his yummy treats as we call them in 2nd grade. We learned from him, and his style, and then created pictures of our own. 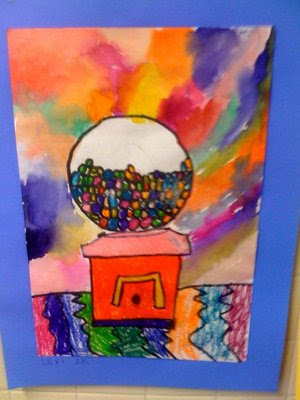 My favorite is this one, of the gumball machine. This project uses oil pastel and watercolor. It's so bright and cheery, and they look great in the hallway.